Dubai Food – RARE Camel Platter – WHOLE Camel w/ Rice + Eggs – Traditional Emirati Cuisine in UAE! Dubai Food is incredibly delicious! 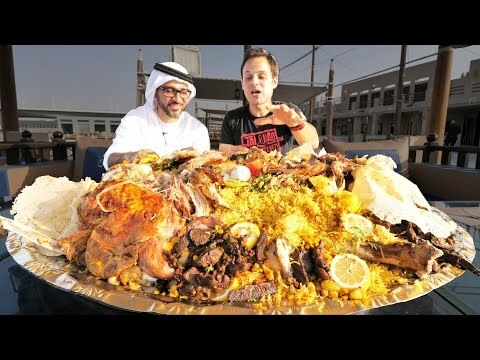 We visited Dubai in the UAE to try some traditional Emirati Cuisine, and joined up with our friend Peyman to eat a whole camel platter with rice and eggs! This is a traditional Emirati meal that is usually reserved for special occasions or very exclusive guests. It’s not a normal Dubai Street Food, but that’s why it’s so good. It is an extremely rare Arab food nowadays! You have to be incredibly lucky to experience this whole camel platter! This is definitely one of the must try foods in Dubai! It is a traditional Emirati food and is one of the best things to do in Dubai. Camel meat is something that may be sensitive to some viewers, so make sure you’re comfortable with watching the camel cooking! The chefs who prepared the camel recipe were originally from the South of India in Kerala, but have been living in Dubai for over 20 years. If you’re thinking of traveling to Dubai for a food trip, you can’t go wrong, there is so much delicious Emirati cuisine and amazing street food to try! I must admit, most of the food is in Dubai restaurants that are clean and quiet, but that is part of the charm of Dubai. If you’re wondering if you should eat street food in Dubai or go for regular restaurants in Dubai, I recommend mixing it up and going for both. In this food video, we are solely visiting one of the best restaurants in dubai for the whole camel plate.